The CoffeeShop Blog: CoffeeShop "Winter Dreams" Photoshop/PSE Editing Tutorial with Winter Action and Snow Brush! 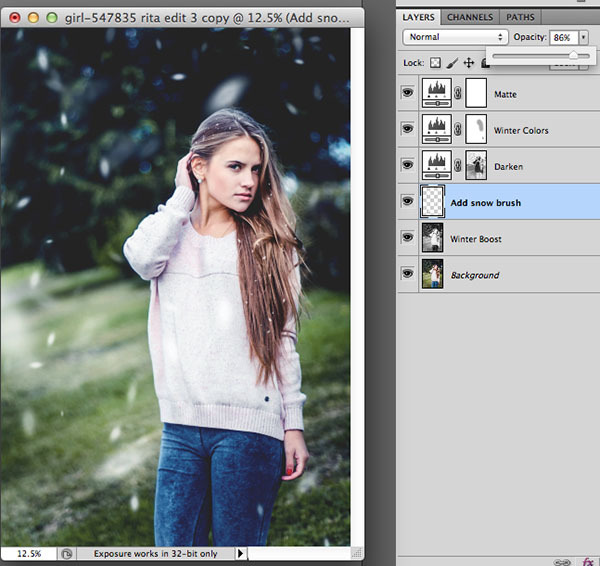 CoffeeShop "Winter Dreams" Photoshop/PSE Editing Tutorial with Winter Action and Snow Brush! Today I am back down to my own two kids and I have to confess the house seems a bit too empty. Right now my boys are playing some made-up war game with blocks and staying out of my hair. It is nice to have some time to work without interruptions. 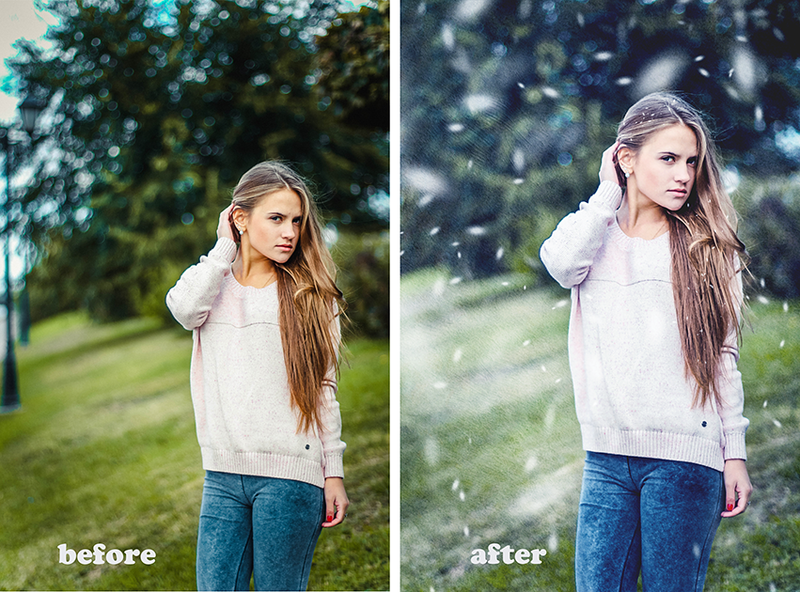 Today I have a really fun editing tutorial which comes with a winter action and snow brush. I was playing with adding snow via a Photoshop brush and googled and found this amazing video at Fstoppers. Before reading my tutorial you might want to head over there and watch his short but very informational "adding snow" video. He also has a free snow photoshop brush that you can download. I created my own with his tutorial and made a few changes (I will write about it below) and included it in my download. I also used this action and my brush on creating this lovely winter snow angel. 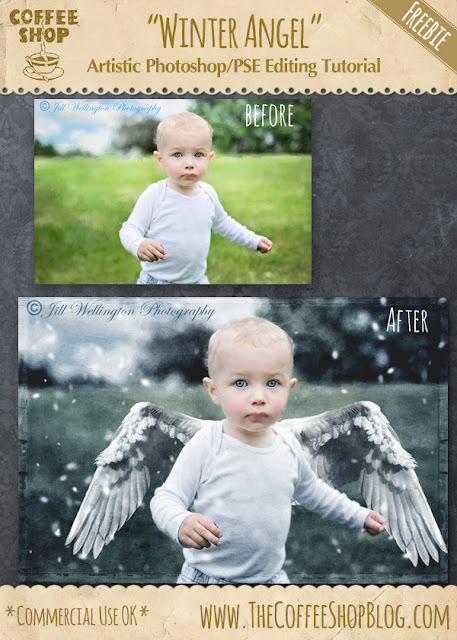 You can read the tutorial and grab the free angel wings here. Note: You might not have to do any of this on your own image if you have great contrast/color SOOC. Brighten Eyes: I opened this image in Photoshop and ran my Bright Eyes action to lighten the eyes. Smooth Skin: I decided the skin needed to be smoothed a bit but I didn't feel like running another action. So I made a copy of the background layer, removed a spot from her forehead using the heal tool, then applied Surface Blur on that layer. 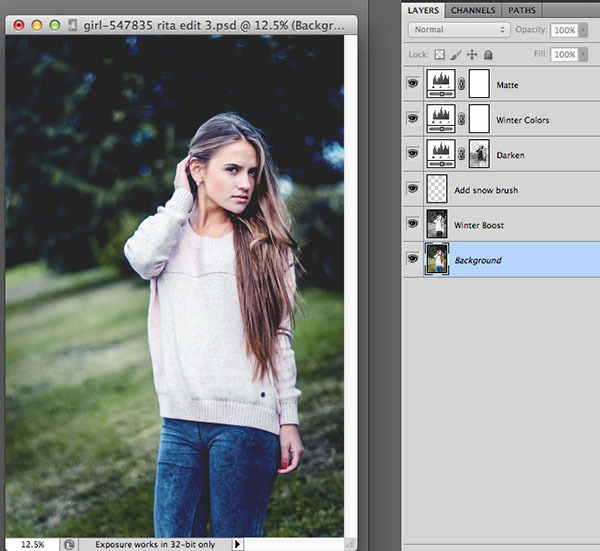 I added a layer mask and removed the blur from her hair, clothing, eyes, lips, etc. with a soft black brush. I like the almost painterly look in this edit. Cloned Out Bright Sky: I found the bright sky in the upper left distracting, so I added a new blank layer above my skin smooth layer and used the Clone Stamp tool (S) to clone in the dark trees over the bright sky. 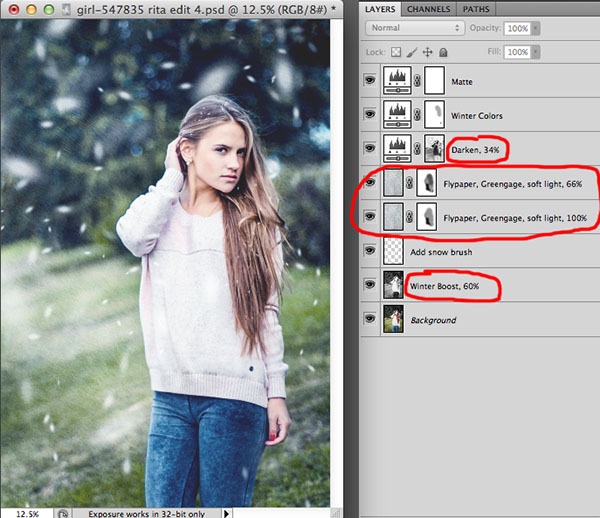 Make sure the Clone tool is set to "all layers". Fix Color Casts: The image had too much green and not enough blue, so I added a Levels adjustment layer on top and added blue and removed green by moving the sliders under the Green and Blue drop-downs, and then I did a final contrast adjustment with RGB selected. Run "Winter Dreams" Action: I then ran my new "Winter Dreams" action (included in the download at the bottom of this post). I didn't make any adjustments on the layers other than "Winter Color" on this run, but you might want to play with them on your own images. Remove "Winter Colors" from skin: I like to paint off some of the "Winter Colors" layer off skin. 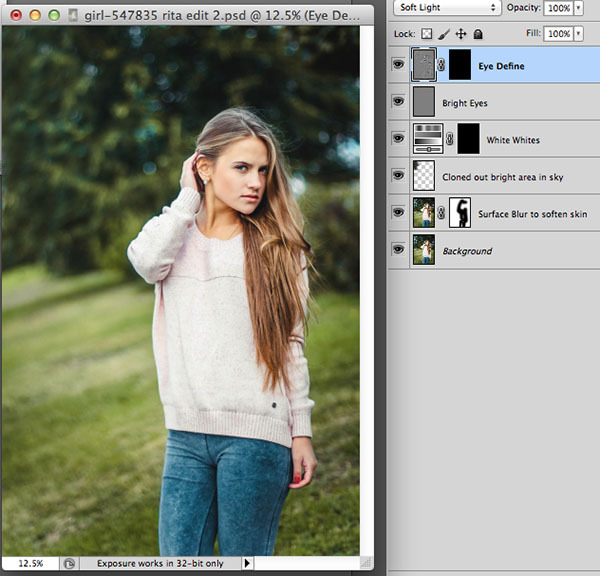 Click to select the layer mask and use a soft black brush at 20-40% opacity and paint over skin and hair if needed. I want some warmth in a portrait's skin. 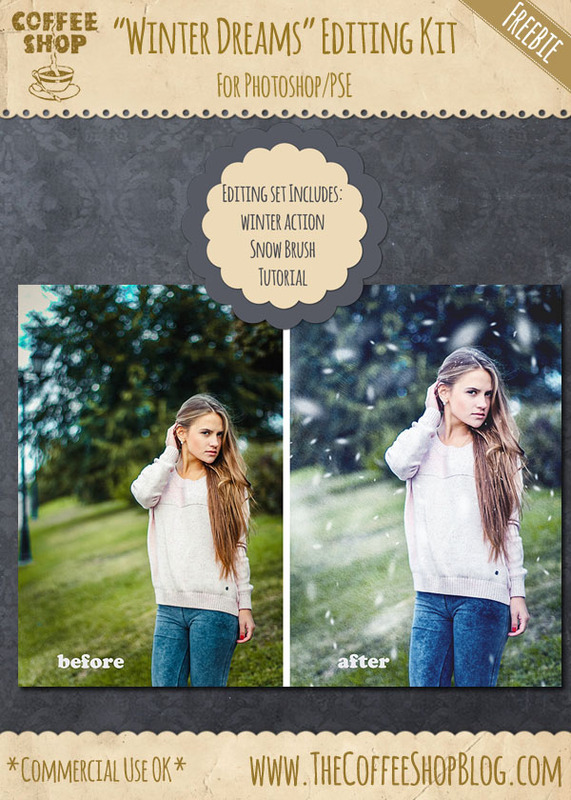 Add Snow with Photoshop Brush: If you haven't yet had a chance, please go visit Fstoppers and watch his video on adding snow with a brush. He explains it so well I am leaving it up to him. :-) He also has a free snow brush you can download. I also made one and included it in my download as I made a few changes. I liked the snow to be a bit more round and I also decreased the spacing (screenshot above). 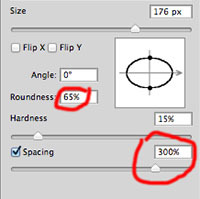 You can use either brush and adjust the settings and save your own perfect snow brush. I clicked on the Add Snow Brush layer, and grabbed my snow brush, set my foreground color to white, and started painting (click and drag) on the image with a small to large brush. You can change the size of the brush on-the-fly by clicking the [ and ] keys. Use the eraser to remove unwanted snow and be sure to zoom in and add some on her hair (using the technique mentioned in the video). 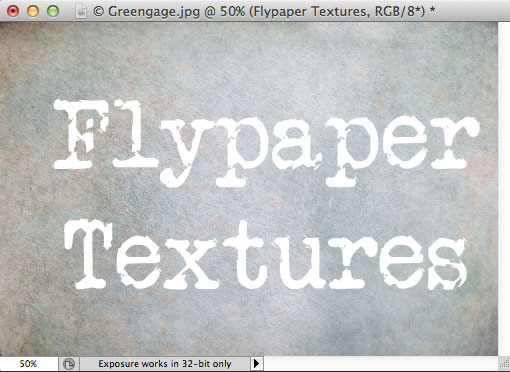 Adding Texture: I went a step further and added the Greengage texture from the Flypaper Pastel Painterly set. They are some of my favorite textures. Shadowhouse Creations also has beautiful textures and they are free (but please consider leaving a donation if you love them, Jerry is a nice guy!). I added the texture (after desaturating it) above the snow brush layer and put it in soft light, 100% blending mode. I painted most of it off my model and then Ctrl-J (copied) that layer and put the new one in soft light, 66%. Here is my before and after. I really love how this edit turned out! 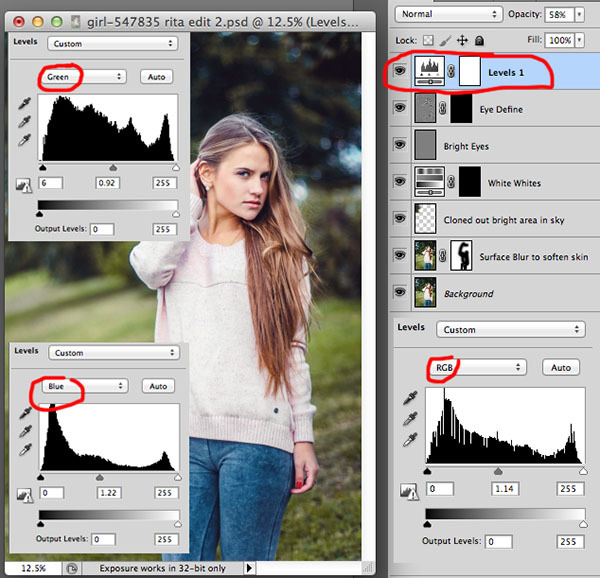 You can use editing technique on all types of images. I found this one on Pixabay also. I ran the Winter Dreams action and then added my snow. I wanted to create dramatic lighting, so I added a Levels adjustment layer over the Darken layer and put it in screen mode, 100%. I then filled the layer mask with black to hide the effect. I grabbed a soft white 100% opacity brush and clicked over the model to dodge (spot lighten) the image. If you have any questions or comments please leave them here or post them on my Facebook page. I would love to see your before and afters!!! 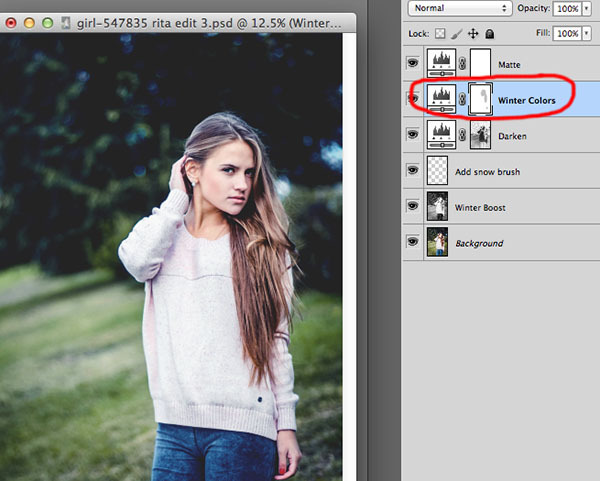 Download the CoffeeShop "Winter Dreams" Photoshop/PSE Editing Kit (includes action, snow brush). You can also download it here. Another great action and tutorial. Thank you Rita. Thank You Rita for great action!